The recent London riots made me feel embarrassed to call myself a Londoner. First time feature director Lee Sales' effort makes me feel similarly morose. For the most part, 'Turnout' is as hapless as its central character George (George Russo) - lost in the mire of drug deals gone bad, relationships gone bad and films gone bad. I imagine this film took many years of work to bring to the screen, a product of a collaboration between Sales, Russo and another of the central actors, Francis Pope. Hence it gives me no pleasure to stick the knife into 'Turnout'. But then again, 'Turnout' gave me no pleasure either. So I figure we're even. George has never had a job. Instead, he spends his time pratting about with his mates around their local area of Hoxton or partaking the occasional recreational drug. Sometimes he even has some time to spare for his girlfriend, Sophie (Ophelia Lovibond), who works in the City and is desperate to go off on holiday to spend some quality time with George. The problem comes when jobless George loses some money and then "borrows" Sophie's savings to try to make some cash through some drug dealing. Except he's a rubbish drug dealer with rubbish mates, and before too long, everything's going wrong. Again, quelle surprise. To be honest, not much goes right in 'Turnout'. Lovibond brings little to her role as the whiny, self-centred Sophie while George's general stroppy nature also proves to be less than endearing. It's not just the characters that are problematic - the sound mix is terrible, with the soundtrack overpowering the increasingly inane and already-difficult-to-decipher dialogue. The thinly veiled shot at the "trendies" of Hoxton falls on deaf ears when pretty much every local character in 'Turnout' turns out to a massive idiot. Although, at least in the case of Plan B's searing cameo, where he attacks someone with a stanley knife, this is turned into something of a positive. The ending, too, is something of a positive and not just because of the fact the film finally finished. Unfortunately, the film's sole endearing moment isn't worth the wait. However, the ending's hint at redemption will hopefully reflect a meta-analysis of the careers of everyone involved in the production. Because they can certainly do better. And they will do better. British independent cinema need not be insipid. London-centric films need not fall into caricature. 'Turnout' unfortunately ticks the boxes for both those categories. Cherish the likes of 'Attack The Block' and 'Kidulthood' - thoroughly engaging independent films based in London. 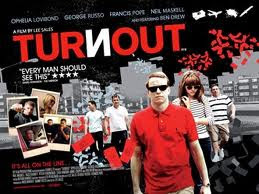 'Turnout' is out on limited release in UK cinemas from today. Pre-order the DVD ahead of its September 26 release date.